Since the party was over I spent the whole week waiting on UPS. My new stamps finally arrived late Friday evening! While I was waiting, I finally finished unpacking my new office! It had to be done because my blocks were missing and it is hard to stamp without them! 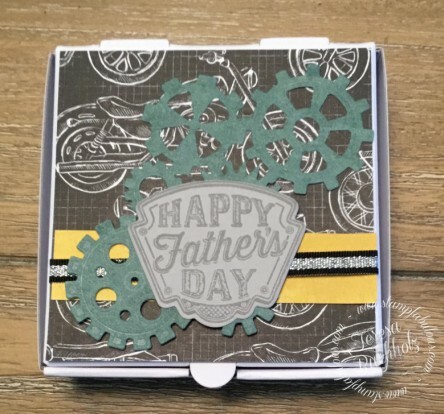 I wanted to share this cute box using the All Geared Up stamp set. The set comes as a bundle in the new catalog! It is a guy card winner in my book! It has a car, gears and some really cool features! Why didn’t I notice those pizza boxes before? I am staying home during Thanksgiving to play with all my new stamps! I have a Gorgeous Grape Butterfly card for you tomorrow! Yes, I am using Purples tomorrow!